Complete your safe sleep modeling program by sending parents home with a gift they will love through our Discharge Gift Program. You’ll be giving parents a gift from a brand they recognize and trust that will help them practice safe sleep at home and reinforce your patient education program. Our Discharge Gift Program allows you to purchase our SleepSack® swaddle and/or SleepSack® wearable blankets at special hospital pricing. 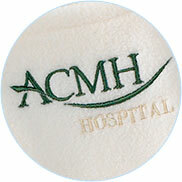 Customize your gift to parents with our logo program, which allows you to custom embroider your hospital’s logo on each wearable blanket. It’s an ideal program to help you gain additional recognition as a safe sleep leader in your community. Free safe sleep educational materials for parents and staffing. Presented in premium packaging with easy-to-use instructions. Mix and match sizes to meet all your needs. 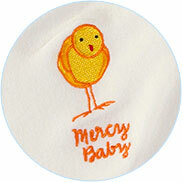 Available in 100% Cotton and Micro-fleece. Select from 6 premium colors. Get started with you gifting program today, by requesting a FREE sample program evaluation kit. No initial set up fee. Complimentary inventory storage for one year with convenient shipping options for custom logo orders. 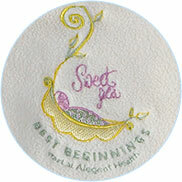 Your premium embroidered logo may included up to 9 colors and 2,050 stiches. One thing I was taught in my hospital was sleeping safety and I was lucky that our hospital worked in connection with HALO to receive a swaddle at birth. 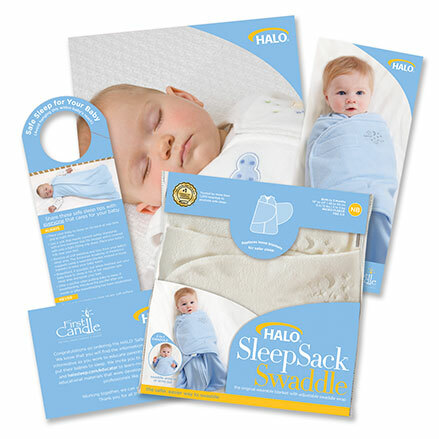 Fast forward from 2007 and we've received one with each new baby we've welcomed in to our life, and then we've been able to continue the "back is best" policy with the help of the HALO SleepSack wearable blankets all thanks to HALO. When we received our Halo SleepSack Swaddle from the hospital I couldn’t wait to open it! The quality of the SleepSack was outstanding. As soon as we swaddled her in it she was one happy baby! And lets be honest a happy baby makes EVERYONE happy. This was definitely my daughter's favorite SleepSack to be in! 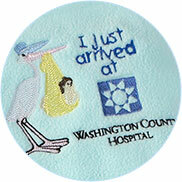 And what a great little keepsake from our hospital. Thank you HALO. We love HALO! The SleepSack wearable blanket gives you peace of mind knowing your tiny, new baby is warm and cozy while sleeping. We also continued to use a variety of HALO SleepSack wearable blankets with my older daughter after she outgrew the one from the hospital. When we had our baby, we used the HALO® SleepSack® Swaddle in the hospital, and were even given one as a gift to take home. What a great solution to address the safety recommendation of no loose blankets in the crib, not to mention practical and easy to use. We continue to use a SleepSack wearable blanket for our 20 month old son, as well as follow other safe sleep guidelines. 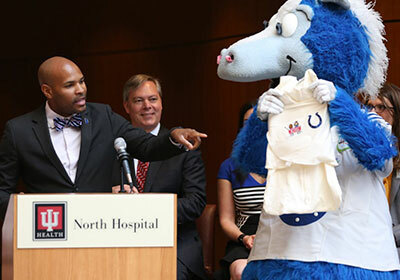 The SleepSack initiative at Riley Hospital for Children aims to reduce the number of infant deaths. Nurses showed the proper way to use a SleepSack which, when used properly, ensure safe sleep and reduce SIDS. 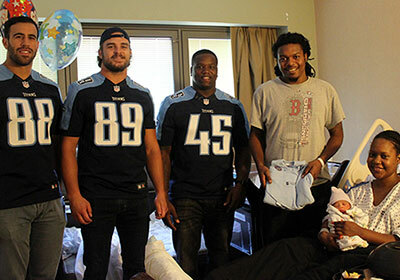 The Titans visited new families at Saint Thomas Midtown Hospital this week in support of Saint Thomas Health’s efforts to promote safe sleep to new parents during National Baby Safety Month in September. 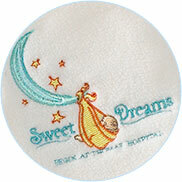 Christiana Care Hospital earns national recognition for infant sleep safety with the HALO Safer Way to Sleep Program. To learn more and start your gifting program, call 888.999.HALO or email safesleep@halosleep.com. For support with your existing program or to place a re-order, please contact customer service at 888.999.HALO or email order@halosleep.com.